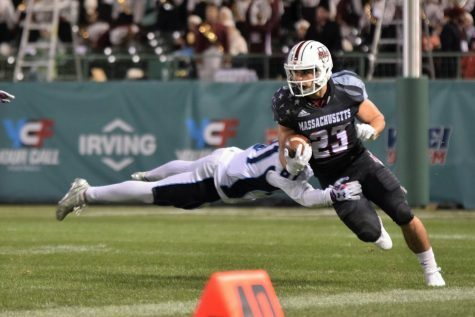 For most of the 2014 season, the Massachusetts football team has looked much better than its three wins had shown. But Friday was not one of those days. The Minutemen dropped their season finale against Buffalo 41-21, finishing the year with a 3-9 record. 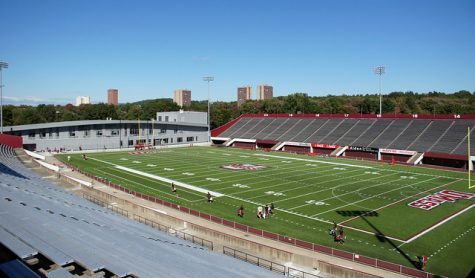 Neither team moved the ball much in the first half until three minutes, 10 seconds left in the half, when Buffalo (5-6, 3-4 Mid-American Conference) receiver Devon Hughes broke the scoreless tie when he beat UMass defensive back Randall Jette in single-coverage from 28 yards out to make it 7-0. The Minutemen defense struggled containing the run, as running back Anthone Taylor finished with 237 rushing yards on 36 carries and a pair of touchdowns. Taylor’s most impressive run of the day came with 3:19 left in the game when he broke open a 76-yard run. Taylor’s other touchdown run came from three yards out. 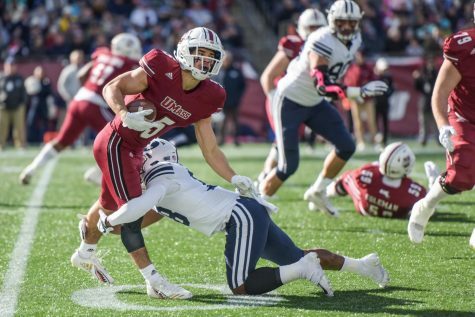 “Buffalo is really tough-nosed and they were going to run the ball,” UMass linebacker Stanley Andre said. Following a 44-yard punt from Brian McDonald that UMass downed at the Buffalo 1-yard line, the Bulls marched down the field on a 17 play drive that took 8:03 off the clock that put them up 13-0 in the second quarter. Although the drive wasn’t the deciding factor in the game, Mark Whipple said that it definitely affected his team. “It takes the wind a little bit out of your sails. We said we were going to control the ball, not turn it over and play defense and we didn’t do it. Give credit to Buffalo, they did what they had to do. We didn’t finish the game and that’s frustrating, also,” he said. Bulls quarterback Joe Licata also took advantage of multiple one-on-one matchups throughout the game. Cornerback Jackson Porter the next victim when he hit Ron Willoughby from 22 yards out with 10:30 to go in the third quarter to make it 20-0. Licata and Willoughby connected on two plays earlier that drive, the first for eight yards, the next for 38. 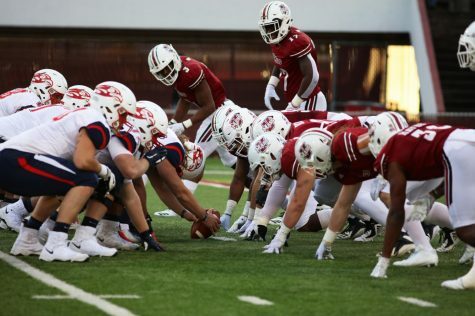 After being shut out in the first half, UMass receiver Marken Michel took a direct snap in the backfield from 50 yards out with 9:50 remaining in the third quarter to cut the deficit to 20-7. Michel finished with 64 yards on four carries. 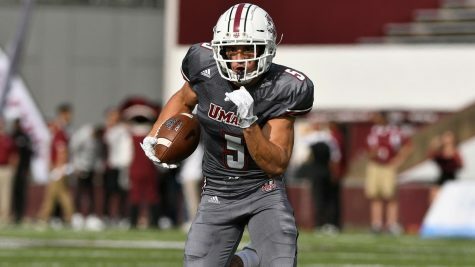 Minutemen receiver Tajae Sharpe had a pair of fourth quarter touchdown receptions, but the game was far out of reach by that time for UMass. The first came from seven yards out while the latter was a 24-yard reception with 1:17 remaining in the game. 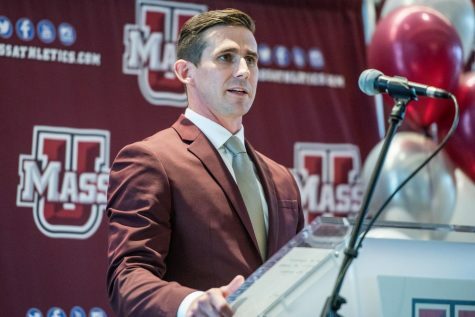 UMass quarterback Austin Whipple lost the battle of the quarterbacks finishing 13-of-28 with 168 yards and two touchdowns. Licata finished 20-of-27 for 255 yards and four touchdowns. The Minutemen allowed a total a 548 total yards off offense and struggled to stop the Bulls hard-nose, grind-it-out style of play. 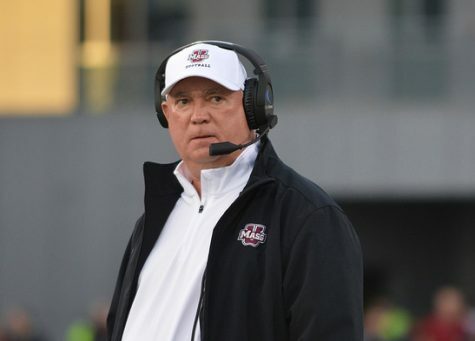 It was the second loss in as many weeks for UMass following a season-ending injury to quarterback Blake Frohnapfel against Ball State on Nov. 12. 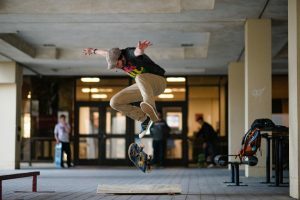 “I think it just opens a lot of eyes and shows us that we need to become a complete team if we want to win. 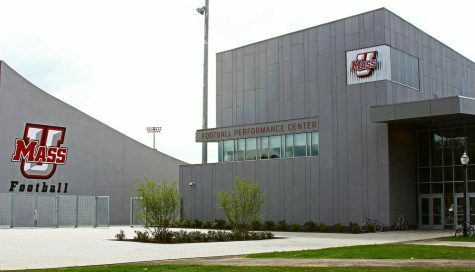 You can’t just depend on one player (Frohnapfel),” Jovan Santos-Knox said. 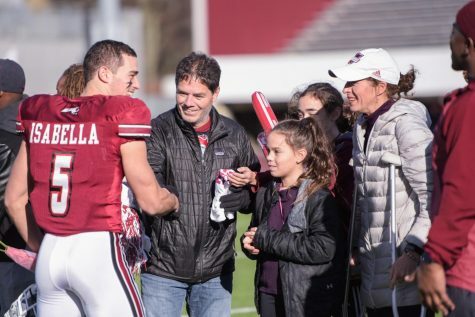 Andre, as well as defensive tackle Daniel Maynes and punter Brian McDonald played their last game for UMass on Friday. Andre led the team with 17 tackles while Maynes chipped in with six of his own. McDonald punted eight times for 387 yards and pinned two punts inside the 20-yard line. McDonald also had a career long 67-yard punt in the first quarter.